Fuel available at Birdsville and Jervois. Water – approx. 5 litres per person used. Prado carried 120 litres, Landcruiser carried 80 litres. Water available at Batton Hill. Track conditions – sand was quite firm and cool due to prior rain (may have improved fuel economy). Although Eyre Creek was in minor flood south of Bedourie it was dry on the QAA line. Many sand dunes between Birdsville and lake north of Poepell Corner. Also dunes east of Beachcomber Oil Well. Track is very well defined. Only corrugations are between Batton Hill and Jervois. Track was dry. Much more fuel would be necessary in wet conditions due to mud driving. 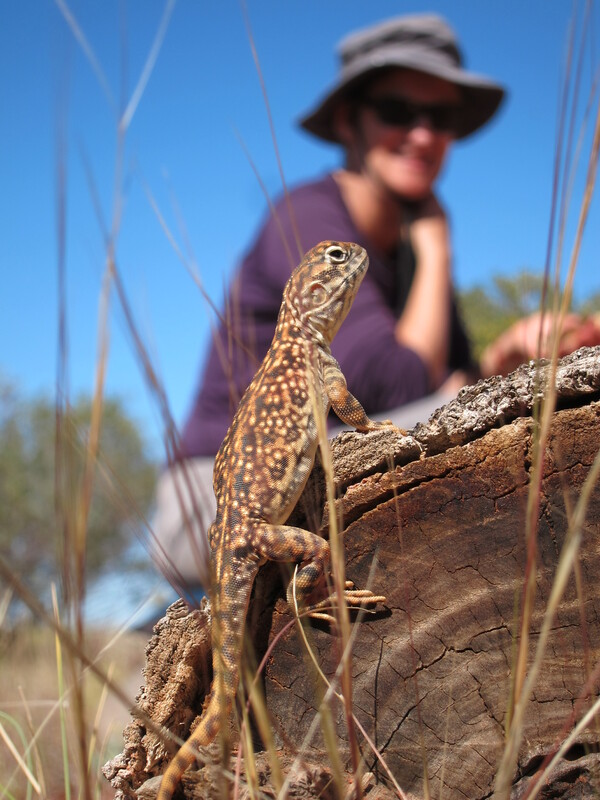 The tours at Batton Hill are excellent – Both Bush Tucker and Sunset tours are driving based and give guided access to hilly country which is spectacular, different to the rest of the track and not accessible unless on a tour. Recommend – DO NOT GO anywhere in the Simpson adjoining the Big Red Bash unless you like traffic. Permits for the Hay River Track are available from Jol Fleming on (08) 8952 3359 or email him at jol@direct4wd.com.au. 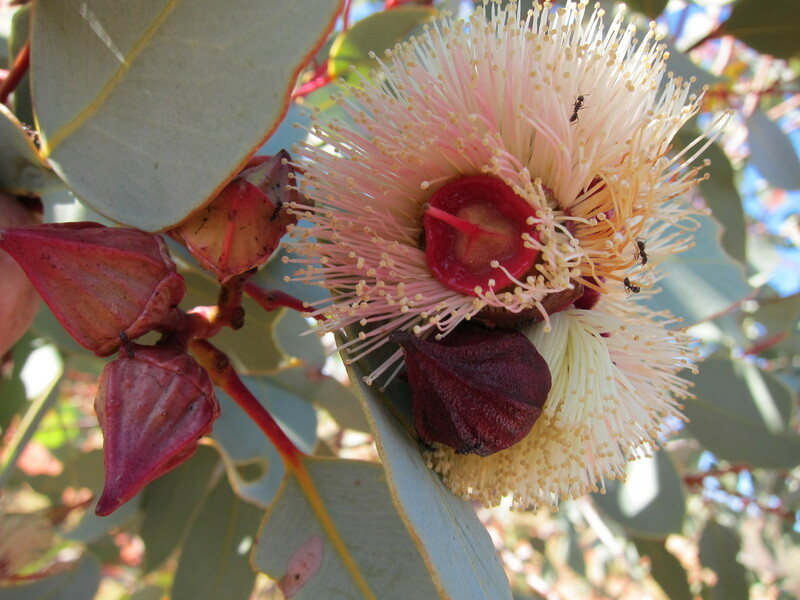 You will also need a Deserts Parks Pass from the South Australian NPWS. Red Bash – a 3 day music festival of good old Aussie rock (Jimmy Barnes, The Angels, Christine Anu, Paul Kelly…). It seemed like all the owners of four wheel drives were on the same road, mostly in more of a hurry than us. Selfish hoons sped past spraying stones our direction. Muddy sections and water crossings painted our car brown. On the “town” perimeter we passed lines of camper trailers parked in the dust. Then on to Little Red. Tyres deflated. Cruised to the top among the day trippers. 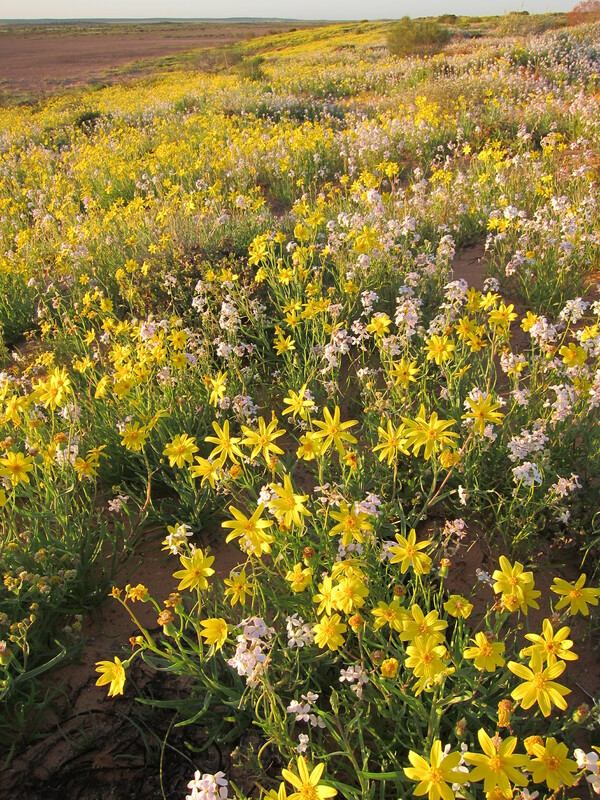 Out along the QAA Line for an hour then we camped on the edge of a clay pan surrounded by fields of yellow and white flowers. Solitude, quiet, isolation. Stars. We chatted about aboriginal people and culture in the fire’s warmth – this followed on from three days of travel listening to a talking book called “The Red Chief” by Ion Idriess which was a story passed on to Idriess about the life of a leader of the Kamilaroi nation near Gunnedah before the coming of Europeans, and my reading of “The Short Long Book” about Michael Long and Stan Grant’s “Talking To My Country”. It seemed right sitting under the river of the Milky Way and looking up at the Emu In The Sky to be trying to open up to indigenous Australia. I was already anticipating our sojourn at Batton Hill at the north end of the Hay River Track. It was election night. Updates were texted in to the satphone. Oncoming traffic on the dunes was headed in to The Bash Bash. At morning tea I noticed a crack in the windscreen. Game over? Charles had the same but smaller. 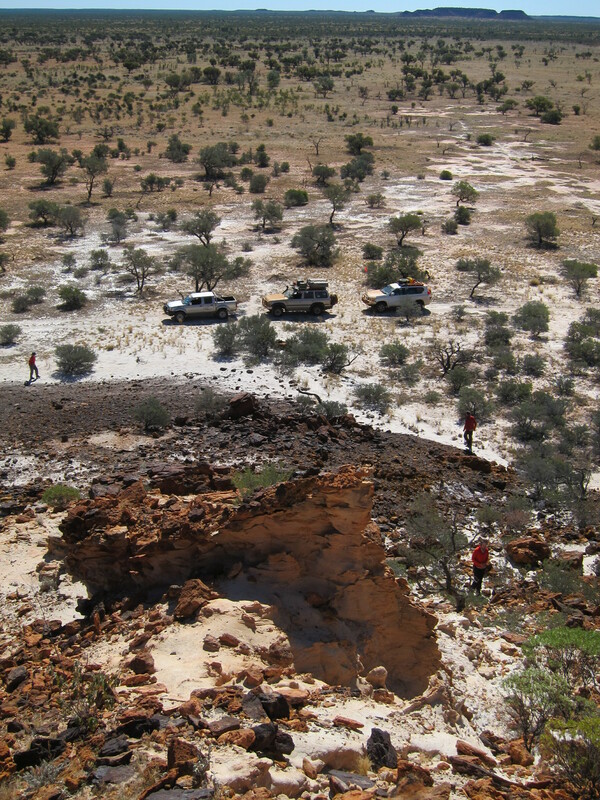 Must have been from stone impacts driving up the Birdsville Track! It was frustrating to think that our trip could have been compromised by others when we had prepared so thoroughly. I pulled out the windscreen repair kit. Charles’ opinion was that it shouldn’t be catastrophic – laminated glass cracks should only be in one layer. I had visions of the whole thing splintering from the torsional stresses placed on it from the dune driving. And driving through the dust with no windscreen, and the rain!? We squeezed resin into the cracks and decided to keep going and monitor and repair further as best we could. The prospect of return to Birdsville was horrendous. More dunes. Like a fun roller coaster drive. Traffic radio calls. “Party of 5 heading east on QAA cresting”. As the calls got louder and clearer we slowed and made contact to avoid dune top meetings or collisions. Tall sand flags mounted on bull bars which appeared above the crests were an early warning system. All the latest 4WDs, some old ones, camper trailers small and large, big vehicles, some looking way overloaded. One landcruiser with a tray top camper slowly made his way past with a broken rear axle – in front wheel drive. Apparently he needed several goes on the bigger dunes but only needed the occasional assistance! “The Simpson will catch you out when you least expect it” had warned a guy at the Bakery whose whole roof rack had sheared right off. Fields of white, yellow and some pink lined the track. 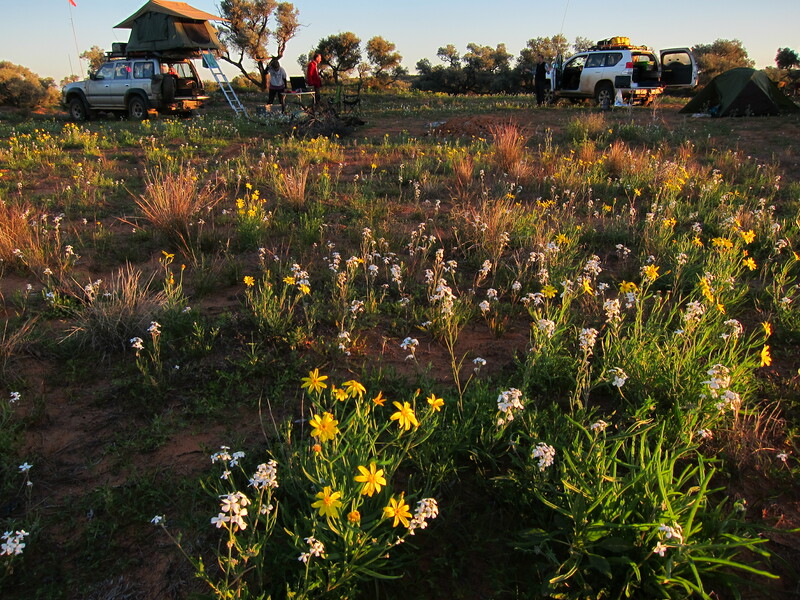 We camped in a delightful vale among small mounds topped with mulga trees surrounded by flowers. “Narrow Leafed Hopbush” Camp. Magical gardens lit up all around in the afternoon light. A salted clay pan lay almost hidden nearby. We’d been drawn back into this iconic landscape. Any trip into “the desert” can be a profound and spiritual experience if you open up to the place. We were making a journey deep into the country’s heart. Some hoons nearby shot off 2 distress flares for fun into the still night sky. Sounds of their drunken carousing and muffled music broke the silence. A last short section of hectic dunes led us to a lake where we left the crowds and started north on the Hay River Track. 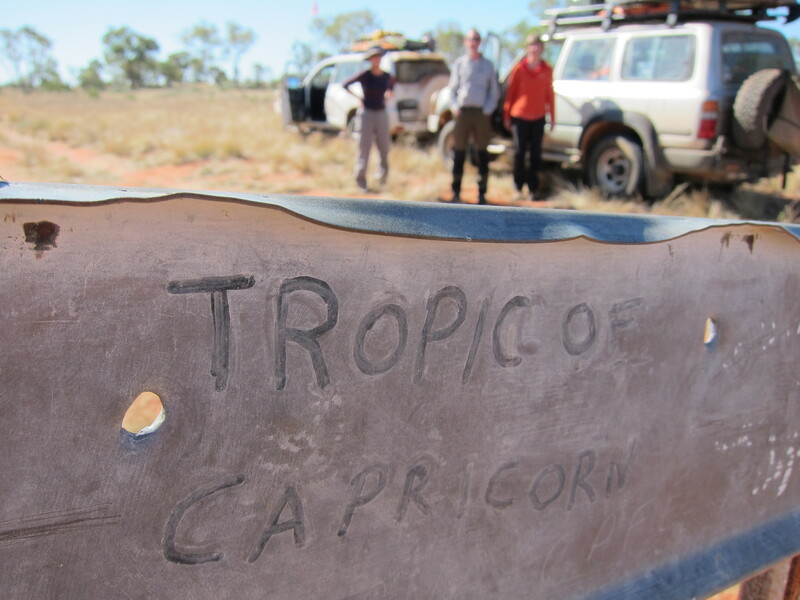 Not far away was Poepell Corner where three states meet, Northern Territory, Queensland and South Australia. For some this point is the centre of Australia. In 1845 Sturt set out to find the centre where he hoped to find an inland sea. His party carried a boat but discovered only a sea of endless sand dunes and searing heat – The Simpson Desert. 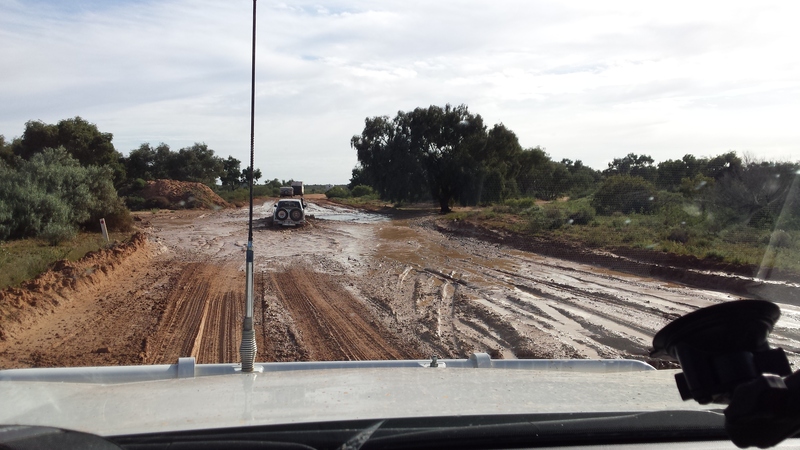 Our plan to miss the crowds and start this trip into the Simpson Desert at the Warburton Crossing and then go up the K1 Line to the Hay River was thwarted by the rain and a flooded crossing which had been closed by National Parks SA. It was a pleasant change to travel between the dunes instead of across them. 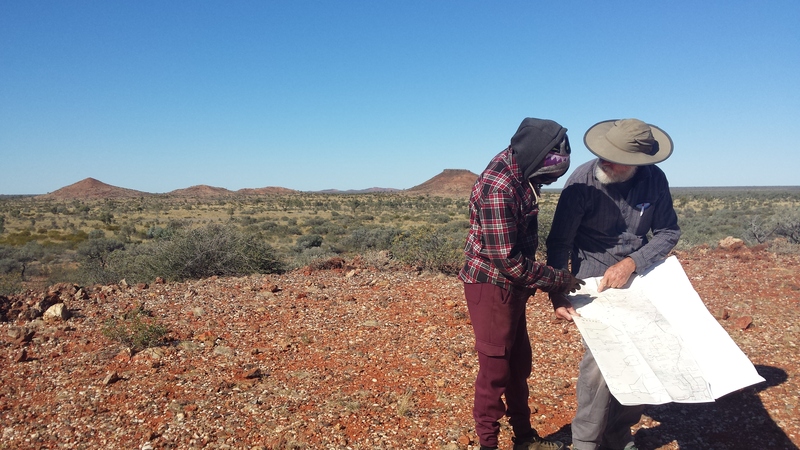 Past Poepel Corner Oil Well we entered spinifex country. Then we turned east for a delightful section of dune crossings. A smaller and more intricate track threaded its way rather than the dead straight of the QAA line made by oil exploration parties to transport drilling rigs and where the tops of the dunes had been dozed. Here the dune crests were more intact and steep. Cath drove, gained confidence and loved the challenge and fun nature of the action without the stress of traffic. The crack had extended slightly so Araldite was added to strengthen the repair – a hopeful act if ever there was one. We reached “The Glove” and headed north again mostly between the dunes. Red, red soil was a different colour and drier, finer and softer than the QAA. Past “Claypan” we camped under a dune with the world laid out. Threatening showers dissolved into an orange and pink sunset. Stunning starscape in the early hours. We packed up in the fine red sand considering what the process would be like in the wet. The crack had not extended out but had side-split in a jagged line to the base of the screen. We met our first other party so far on track. Seeming to be grumpy and stressed they complained about the cost of camping at Batton Hill and being ripped off on the Bush Tucker and Culture Tour as there wasn’t much tucker (in the middle of winter). Then north east into the faint drainage line of the Hay River. We met two more parties, one from the Madigan line. Madigan crossed the Simpson in 1930, establishing a series of camps as he sought the geographical centre of the continent. The Madigan Line tracks leading into camps 15 from the west and out of camp 16 to the east looked well defined. Another passing group told us the people at Batton Hill were all away on men’s business. I couldn’t quite discern whether they were just disappointed or maybe angry as well. Another beautiful camp nestled under a dune. “Dragon Fire Camp” – a hollow log spouted flame through both ends. Stars. We talked about Land Rights, health, the Apology, why New Zealand and other countries have treaties and not us, the Preamble – the little we knew and the lot we didn’t. In 1992 we had cheered as Mandawuy Yunupingu, principal of Yirrkala Community School was named Australian of the Year. In 1991 his voice had rang out through dance clubs around the globe as front man of Yothu Yindi. “Well I heard it on the radio and I saw it on the television. Back in 1988, all those talking politicians. Words are easy. Words are cheap. Much cheaper than our priceless lands. White promises can disappear just like writing in the sand. Treaty yeah. Treaty now.” He had died prematurely, like many of his countrymen, aged 56, of renal failure. We reached the spot on the map named “Aboriginal Midden” and parked in the shade for lunch. It’s a large open beautiful spot on a bend in the river bed. Holes in the channel would hold water. It would make a great camp site. Tuned in to the country Fiona quickly found the stone tool midden. Fragments were spread over a wide area. I imagined ceremonies there, large gatherings of people in the past. Stretching back past the end of the last ice age when maybe the ancient Hay River flowed with more regular water. I considered camping there but felt weighed down with too much history and sadness and story. Were they massacred here too, or poison water holed or just pushed off by pastoralists? Some places have a “feel”. I couldn’t have been comfortable there overnight. Birdwatching along the way. Bustard, red backed kingfisher, little eagles. We called Batton Hill on the sat phone and checked our tour booking. All seemed well. I turned on the radio again. We could only get one station. Of course it was NAIDOC Week. The country’s heart was spilling out towards me. In and out of faint reception we listened to snippets of an interview with Timothy Bottoms who has documented the killing of tens of thousands of Aboriginal people on Queensland’s frontier as “new” land was opened up. And the “Conspiracy of Silence” that has taken place as the authorities in Brisbane and Sydney were not interested, and the pastoralists had every reason to keep it quiet. 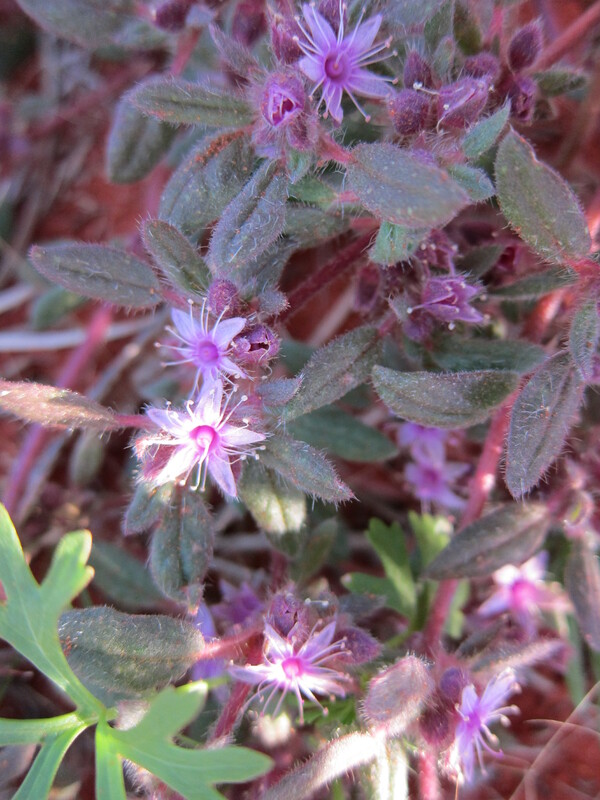 Delightful driving, landscape, slow and winding, flowered, spinifex, grassland. A side track led us across the bed of the Hay River which was by then a wide expanse of soft sand. At camp we found rocks that looked like asteroids – “Asteroid Camp”. We tried to encapsulate and explore more aboriginal culture issues – remote camps, dispossession. Cath told the story of how we had met the Mayor of the Laverton area in WA when we were crossing the Anne Beadell Track a couple of years before. We had crossed paths about 400km along the track. 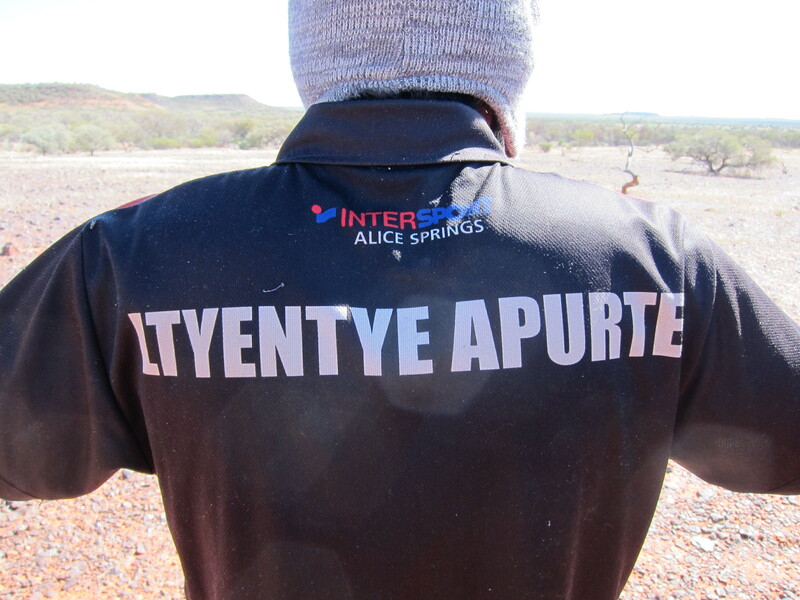 He was returning from a meeting at Tjuntjuntjara which must be one of the remotest Aboriginal communities in Australia. 680km out and south of Ilkurlka it took him 2 days to drive there. The people were his constituents. They wanted to remain on their own country. The Mayor had met there with the people and politicians had flown in for the meeting. He wanted 5 million bucks so he could fix the water supply, improve the health services and the school. To get these things to a standard nearer to those of his other constituents, the white people who lived in remote small towns in WA and also wanted to stay where they were on their land as they had grown up there and had a history going back some generations. Basic human rights in Australia really – health, water, education. 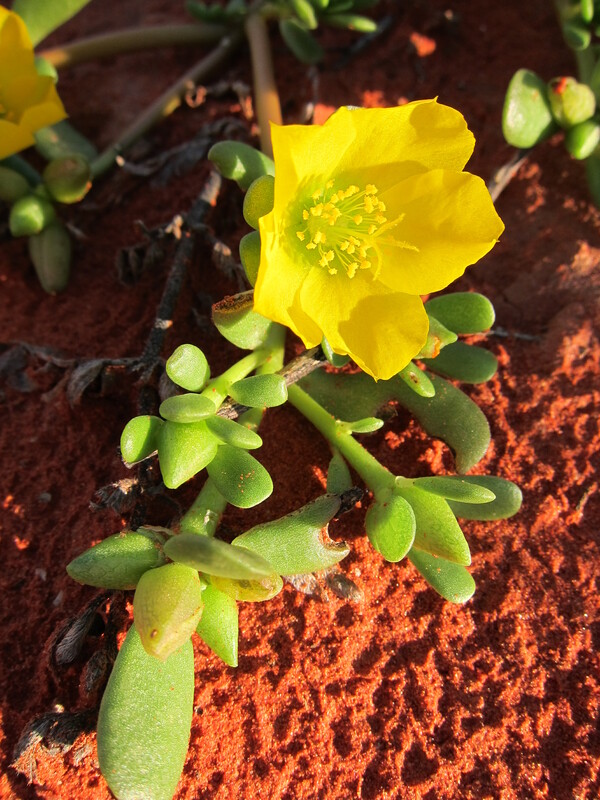 Tjuntjuntjara is in the Great Victoria Desert Nature Reserve. I wondered about their rights to the land. The Lake Caroline Claypan is huge and flat and desolate. I walked alone out into the middle. Enormous space. I felt like running. Cracked, intricate texture. Dingo Well is a permanent water bore made by Elder Lindsay Bookie and a conservation organisation. The aim is to reintroduce dingos by providing a permanent water source of the sort which would have been in place pre contact and which would have been maintained and cared for by the Aboriginal people. Zebra finches flocked in great numbers. A small lizard comraded with Cath as she used its hollow log as a luncheon seat. Afternoon radio played Emma Donovan singing songs of her aunty Ruby Hunter. Ruby had been life partner of Archie Roach having met as homeless teenagers on the streets of Melbourne. Her deep soul voice and words echoed through Emma’s singing as we drove. “Down city streets I would roam. I had no bed. I had no home. There was nothing that I own. Use my fingers as a comb.” Both Ruby and Archie had been forcibly removed from their families when they were young children – part of the stolen generation. The track became less windey in the afternoon. The gearbox was changed into third gear for the first time in a week. Two large white barked ghost gums provided a gateway into Aboriginal land at the edge of Batton Hill. Lindsay Bookie’s daughter (and now custodian), her daughter and “Puppy Dog” welcomed us, showed where to set up camp and confirmed arrangements for the following day’s tour. We settled in for an afternoon of welcome hot showers, running tap water, clothes washing and relaxing. Groups of noisy cockatiels flew about the camp. 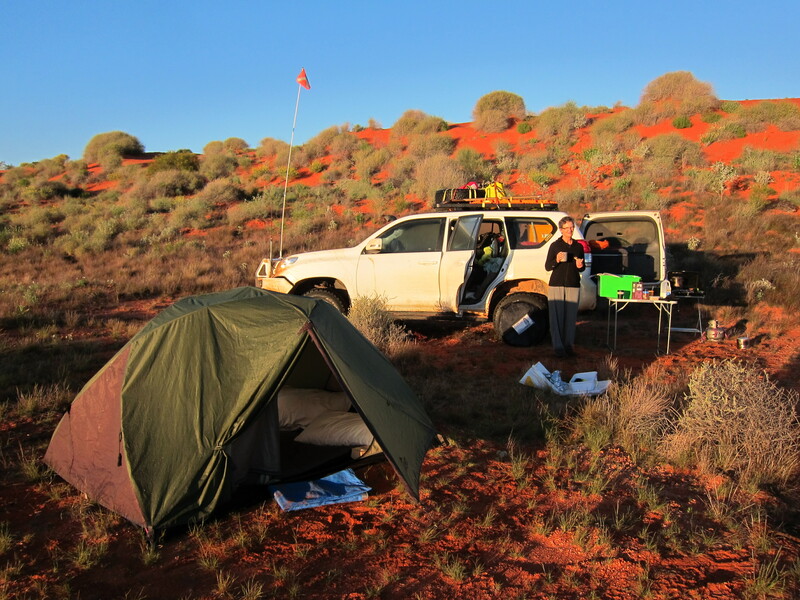 We felt a sense of accomplishment and relief at having crossed the Simpson Desert and reached civilization. Sunset, zodiacal light. Stars, fire. Charles, an energy scientist, felt strongly that at this time in our shared history we need to have a custodian style of care for the land. Our guide (permission is being sought to include his Lindsay’s daughter’s names in this narrative) led the “Bush Tucker Tour” from the front in his black 4WD ute. He was quietly spoken, reserved, gentle and sheltered under a beanie and hoodie and big dark glasses. 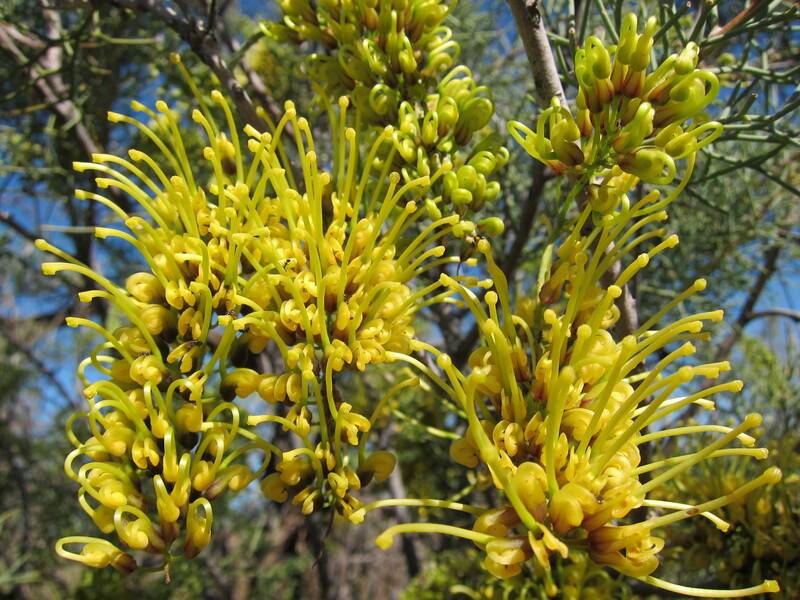 He took us through landscapes we had not seen, hills, mini eucalypt woodlands, rocky mesas, past jagged ridges. The first lookout gave wonderful views in all directions. We chatted a little. When I mentioned I had just finished reading the book about Michael Long he became animated and told me Long was his hero. Also that he had played AFL as a boy and young man. It seemed that in many ways events and our journey into the desert had conspired and led me to this conversation. I told him we were from Canberra and asked if he was from around Batton Hill. His father had been a close friend of Lindsay Bookie. He pointed out his home country on the map – a little over to the west. When his father fixed his hilux they were going to go over to the station there. He proudly told me his father had taken him to Dalhousie Springs on the other side of the Simpson for Land Council business. Where you are from and who you are related to – these are important points of connection. Further on he showed us some bush bananas which would be in season in summer. At the next lookout he took off his hoodie and showed me his footy team shirt from Santa Theresa. Ltyentye Apurte the team was called. The traditional name for Santa Theresa. The colours were the same as the Saints – St. Kilda. He’d played under 17 at age 12 and then went straight to A grade. Later on he played for the Plenty Highway team. “Across the Northern Territory this game we love brings hope to thousands. It’s something that I’m really proud of. Every week remote development managers are delivering football programs that improve the quality of life for entire communities. We need a focal point for these life changing projects. My dream is a simple one. To build a learning and leadership centre to encourage children in remote communities to attend school, to develop leadership skills and above all to develop the self-belief so that they can and will succeed in life no matter what. The centre will have a focus well beyond elite athletes. It will provide a sporting and educational model available to all territorians. Using the power of football, the sport that means so much to many, the centre will help young territorians to be all that they want to be. This is our opportunity. These are our children. This is their future and this is my dream.” Michael Long – Michael Long Learning and Leadership Centre website. I couldn’t help thinking that Michael Long would have been extremely proud of this young man who had been inspired as a youngster to take up sport, continue his education and now to be generously sharing his story and country. 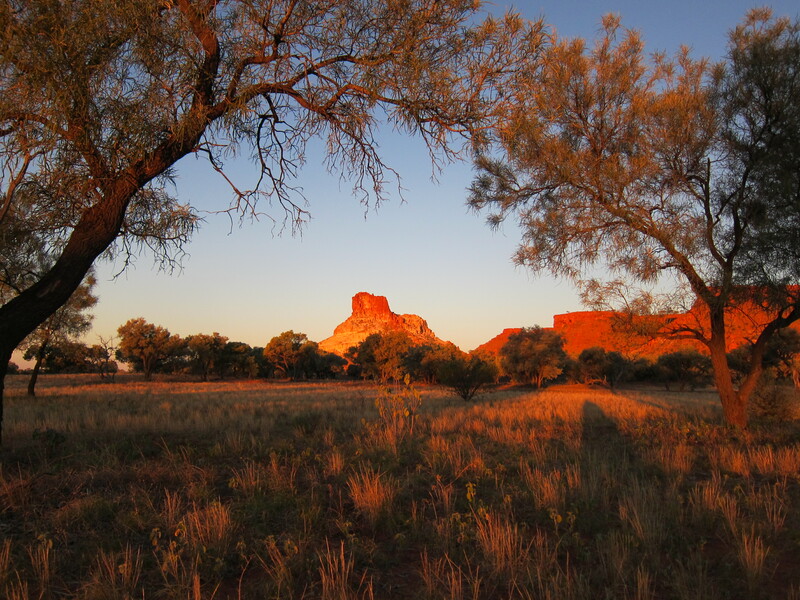 Lindsay Bookie, buried adjacent to the Camp, was an Eastern Arrernte member of the Rain Dreaming clan. He had led the native title claim for this now freehold Aboriginal land, had set up Batton Hill Camp and established the Hay River Track. These initiatives provide income and employment for his extended family group. Our guide and the small group who run the camp and tours stay at Batton Hill during the tourist season. Late in the afternoon he took us out to Goyders Pillar on the private property station next door. This is a very special area of small peaks and ragged scarps that catch the changing light at sunset. At the base of the Pillar, almost hidden under a low bush, is a large grinding stone. I could sense the possibility of important dreaming stories in the landscape. Sunset, stars. A warm night. Crescent moon over ghost gums. In the morning we paid our respects before departing. 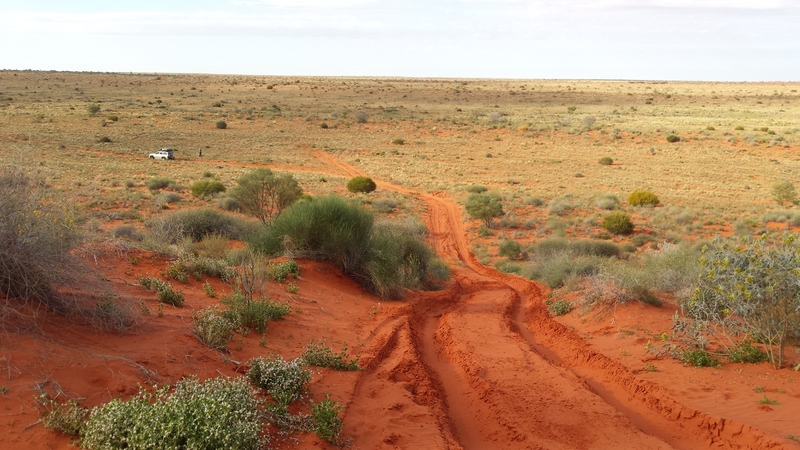 Thanked Lindsay’s daughter for letting us travel the Hay River Track through her property on what must be one of the most delightful, remote desert 4WD touring routes anywhere. And for sharing her country. As we walked back to the cars I wondered if the guide’s and Lindsay’s daughter’s missing front teeth were a sign of deep cultural knowledge, were evidence that against all odds they may have been able to keep their culture alive and walk in both worlds, that they had been able to continue their connection to their country that had lasted hundreds of generations. The oldest living culture on the planet. I marveled at their open generosity. And resilience. On the last two hour section of corrugated straight line dirt to Jervois I found a remote settlement on the Hema map that we had heard about. 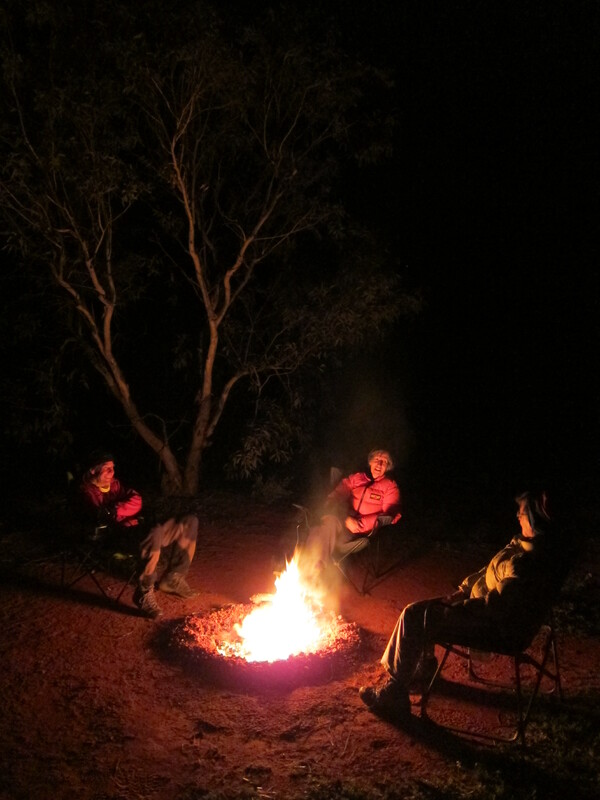 It’s a community about 300km from Alice Springs up the Sandover Highway. Cath had randomly met the school principal from there while drinking coffee in a café in Alice. They got talking and she told Cath about a program where people like us volunteer for a couple of weeks in the school listening to kids read. Apparently it makes a huge difference. We started pondering the calendar for the following year. At Jervois conversation returned again to Aboriginal Australia and we told Fiona and Charles about Elspeth, our daughter, and her work in Roebourne. Her two years with the indigenous community culminated in the premiere of the “Hipbone Sticking Out” theatre show at Canberra Theatre. The community development show was based around the story of John Pat whose death in prison resulted in the Black Deaths in Custody royal commission. In talking about this I could barely hold back tears as I described how at the end of the first performance Archie Roach had sung his song “John Pat” to the boy’s mother who was in the audience and the crowd. The whole show, which featured members of the community including the children that El had worked closely with, was like a barbed spear into the heart or our cultures in collision. On the long drive home we stopped at Cunnamulla for a break and to stretch the legs. Across from where we parked was the courthouse. Small groups of indigenous people were the only people that waited conspicuously outside. And then back home I read in the paper that apparently Eddie Maguire had regretted his very public racist comments about Adam Goodes, another Australian of the year. Their black costumes were emblazoned with the single word SORRY. It felt like a collective sorry for the stolen generations, sorry for black deaths in custody and sorry for disposession and massacres. Can we heal what’s in our country’s damaged and broken heart by properly and honestly acknowledging our black and white history, by saying and being sorry, by making amends? Is it even possible? To respect and value? To connect? Batton Hill shines for me now like one small beacon of hope. A few days later while waiting for the NRMA house call to fix the windscreen Radio National aired a program examining the indigenous rangers caring for country program across the north of Australia. And its struggle for funding. Mine was the last booking of the day. Andrew arrived at 6.00pm, having started the day at 7.00am, his tenth and last job. He worked with consummate skill and patiently answered all my questions while waiting for the primer and glues to set in the cold weather. I took photos of a heavily vandalised smashed screen in the back of his van as he pointed to the inner vinyl layer that had kept it in tact. All this info could be passed on to my 4WD club. He said he didn’t mind if his (black) finger featured in a photo in the club magazine. I searched for a final metaphor in the smashed glass, the careful fixing up and the sharing of knowledge. Post script – At the 2016 election more indigenous MPs were elected to federal parliament than at any other time in Australian history. Ken Wyatt, Pat Dodson, Linda Burney.